King of Salem and priest of the Most High in the time of Abraham. He brought out bread and wine, blessed Abram, and received tithes from him (Gen. xiv. 18-20). Reference is made to him in Ps. cx. 4, where the victorious ruler is declared to be "priest forever after the order of Melchizedek." The story is neither an invention nor the product of a copyist's error, as Cheyne ("Encyc. Bibl.") thinks, but rests upon ancient Jerusalemic tradition (as Josephus, "B. J." vi. 10, affirms; comp. Gunkel, "Genesis," 1901, p. 261), "Zedek" being an ancient name of Jerusalem (probably connected with the Phenician Συδνκ = "Zedek" = "Jupiter"; comp. Shab. 156a, b; Gen. R. xliii. ; Pesiḳ. R. 20; see Baudissin, "Studien zur Semitischen Religionsgesch." 1876, i. 14-15). Hence "'ir ha-ẓedeḳ" (Isa. i. 21, 26), "neweh ẓedeḳ" (Jer. xxxi. 23, l. 7), "sha'are ẓedeḳ" (Ps. cxviii. 19). The city's first king, accordingly, was known either as "Adoni Zedek" (Josh. x. 1 et seq. ; comp. Judges i. 5-7, where "Adonizedek" is the correct reading) or as "Malkizedek." The fact that he united the royal with the priestly dignity, like all ancient (heathen) kings, made him a welcome type to the composer of the triumphal song (Ps. cx.). But to the Jewish propagandists of Alexandria, who were eager to win proselytes for Judaism without submitting them to the rite of circumcision, Melchizedek appealed with especial force as a type of the monotheist of the pre-Abrahamic time or of non-Jewish race, like Enoch. Like Enoch, too, he was apotheosized. He was placed in the same category with Elijah, the Messiah ben Joseph, and the Messiah ben David (Suk. 52b, where "Kohenẓedek" should be corrected to "Malkiẓedeḳ"). The singular feature of supernatural origin is ascribed to all four, in that they are described as being "without father and without mother, without descent, having neither beginning of days nor end of life, but made like unto the son of God abiding forever" (Heb. vii 2-3; comp. Ruth. R. v. 3, where the original text [see "Pugio Fidei," p. 125] referred also to Ps. cx. 4, Isa. liii. 2, and Zech. vi. 12, comp. Yalḳ., Reubeni Bereshit, 9d; Epiphanius, "Hæresis," lv. 3). According to Midr. Teh. to Ps. xxxvii., Abraham learned the practise of charity from Melchizedek. Philo speaks of him as "the logos, the priest whose inheritance is the true God" ("De Allegoriis Legum," iii. 26). The Samaritans identified the city of Salem with their sanctuary on Mount Gerizim (see LXX., Gen. xxxiii. 18; comp. Eusebius, "Præparatio Evangelica," ix. 17). The rabbis of later generations, rather antagonistic to the cosmopolitan monotheism of Alexandria, identified Melchizedek with Shem, the ancestor of Abraham (Ned. 32b; Pirḳe R. El. xxiii. ; Targ. to Gen. xiv. 4). A singular story is told of Melchizedek in the Ethiopian Book of Adam and Eve, which, before it was turned into a Christian work, seems to have presented a strange combination of Jewish and Egyptian elements emanating from a sect afterward known as the Melchizedekites. There (iii. 13-21) Noah tells his son Shem before his death to take "Melchizedek, the son of Canaan, whom God had chosen from all generations of men, and to stand by the dead body of Adam after it had been brought from the ark to Jerusalem as the center of the earth and fulfil the ministry before God." The angel Michael then took away Melchizedek, when fifteen years of age, from his father, and, after having anointed him as priest, brought him to (Jerusalem) the center of the earth, telling his father to share the mystery only with Shem, the son of Noah, while the Holy Spirit, speaking out of the ark when the body of Adam was hidden, greeted Melchizedek as "the first-created of God." Shem went, carrying bread and wine, and, assisted by the angel, brought the body of Adam to its destination. Melchizedek offered the bread and wine upon the altar they built near the place where Adam's body was deposited, and then Shem departed, leaving the pure lad in his garment of skins under the sole protection of the angel, no one on earth knowing of his whereabouts until, at last, Abraham met him. Compare also "Die Schatzhöhle" (Bezold's transl. 1883, pp. 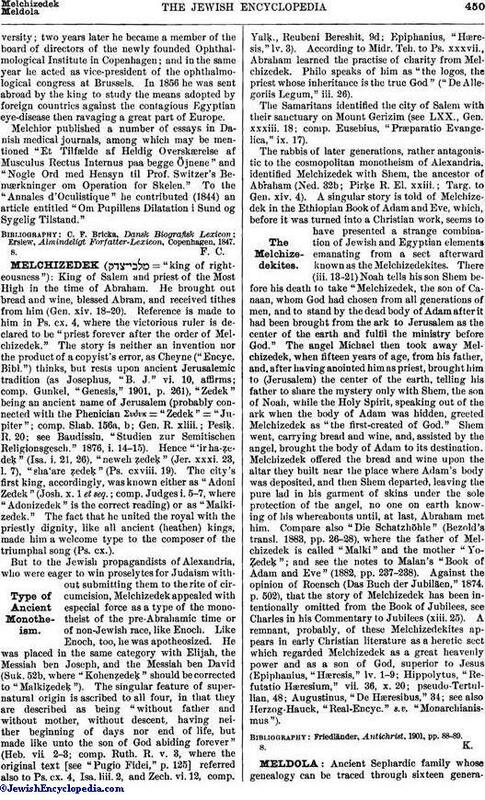 26-28), where the father of Melchizedek is called "Malki" and the mother "YoẒedeḳ"; and see the notes to Malan's "Book of Adam and Eve" (1882, pp. 237-238). Against the opinion of Roensch (Das Buch der Jubiläen," 1874, p. 502), that the story of Melchizedek has been intentionally omitted from the Book of Jubilees, see Charles in his Commentary to Jubilees (xiii. 25). A remnant, probably, of these Melchizedekites appears in early Christian literature as a heretic sect which regarded Melchizedek as a great heavenly power and as a son of God, superior to Jesus (Epiphanius," Hæresis," lv. 1-9; Hippolytus, "Refutatio Hæresium," vii. 36, x. 20; pseudo-Tertullian, 48; Augustinus, "De Hæresibus," 34; see also Herzog-Hauck, "Real-Encyc." s.v. "Monarchianismus"). Friedländer, Antichrist, 1901, pp. 88-89.